The several and separate Answer of Sir Hew Hamilton, otherwise Dalrymple, Baronet, One of the Respondents to the Appeal of Mary Buchan Spinster, was brought in. The Earl of Fitzwalter reported, "That the Lords with White Staves had (pursuant to the Order of Thursday last) presented to His Majesty the Address of this House, for a Copy of the Articles of War, and List of the Promotion of the Officers of the Army; and that His Majesty had been pleased to give Order, that the same be laid before their Lordships accordingly." 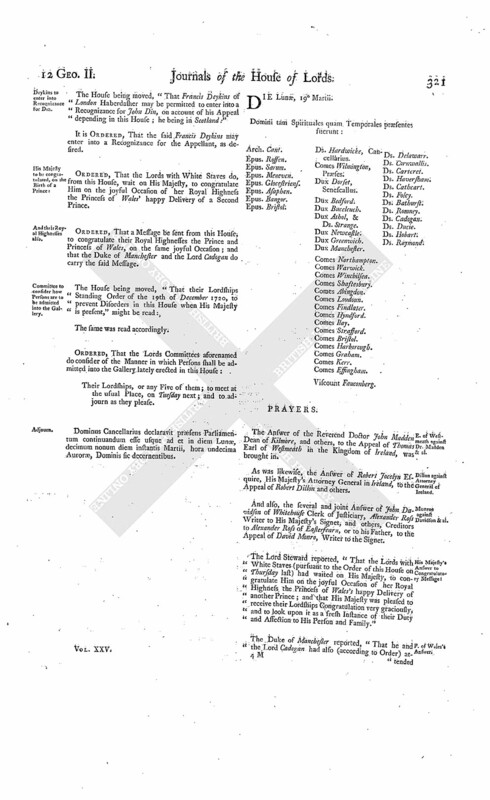 Articles of War and List of Officers delivered. Then the House being informed, "That Mr. Arnold, from the War-office, attended:"
He was called in; and delivered, at the Bar, the said Articles and List. "Articles of War intended to be established for the Year ensuing." "A List of the Promotion of the Officers of the Army, since the 25th of March 1738; distinguishing such of the said Officers as were in His Majesty's Service, or in Half Pay, before the said 25th of March; with the Dates of the Commissions of such Officers." Report about printing Lords Protest. The Lord Delawarr reported from the Lords Committees appointed to inquire after, and find out, the Printer and Publishers of a Paper, intituled, "The Lords Protest against the Convention Treaty; and, A List of the Lords who voted against an Address to approve of the Convention:" "That the Committee having met, in order to make the Inquiry by the House directed, were informed by Mr. John Bancroft, One of the Doorkeepers, "That he the said Bancroft, by the Direction of the Gentleman Usher of the Black Rod, went to the House of James Watson, a Printer, near Doctors Commons; where he found the Press set, and Persons working off printed Copies of the said Protest; and that, pursuant to the Order of the House for that Purpose, he seized all the said printed Copies, and stayed there till the Press was broke." "That the said Watson attended the Committee; and, upon his Examination, consessed that he printed the said Protest; but would not own from whom he had the Copy, pretending that One Copy, which was an imperfect one, was sent him (he did not know by whom) under a Cover, sealed up, by the Penny Post; and that the other Copy, which he printed from, was given to him at a Coffee-house, by a Man whom he never saw before; who told him, "That a Friend and Well-wisher of his sent it him." "That, upon his being examined where he had the List of Lords who voted against an Address to approve of the Convention, which is printed with the said Protest; he said, "That he copied it at a Coffeehouse, from a Paper which lay publicy upon the Table, among the News Papers:" But would not own at what Coffee-house; pretending that he saw the said List at several Coffee-houses; and that he could not recollect with Certainty at what Coffee-house he copied it. "That the said Watson, being asked, "Whether he had the Copy of the said Protest which he printed from?" said, "He believed he could find it at Home." Whereupon he was ordered to attend the Committee this Day, and bring the said Copy with him. "That the said Watson accordingly attended the Committee, and delivered the said Copy to their Lordships; which Copy appeared to be wrote by Mr. Price, One of the Writers in the Parliament-office." Watson, the Printer, committed to Newgate. Ordered, That the Gentleman Usher of the Black Rod do forthwith attach the Body of the said James Watson, for his said Offence; and do convey, or cause him to be conveyed, to the Prison of Newgate, and delivered to the Keeper thereof, to be by him there safely kept during the Pleasure of this House; and this shall be a sufficient Warrant on that Behalf. Talbot's Petition referred to Judges. Upon reading the Petition of Henry Talbot Esquire and Catherine his Wife; praying Leave to bring in a Bill, for vesting certain Estates, in the Petition mentioned, in the County of Warwick, in the Petitioner Henry, in Fee Simple, discharged of the Uses in his Marriage Settlement; and settling Lands in Norfolk, of greater Value, to the Uses of the said Settlement. It is Ordered, That the Consideration of the said Petition be, and is hereby, referred to the Lord Chief Justice of the Court of King's Bench and Mr. Baron Thomson; with the usual Directions, according to the Standing Order. Polson & al. peremptorily so answer Monro's Appeal. The House was informed, "That John Polson and others, Respondents to the Appeal of David Monro Writer to the Signet, have not put in their Answers thereunto, though duly served with the Order of this House for that Purpose." Kent & al. against Whitby & al. in Error. 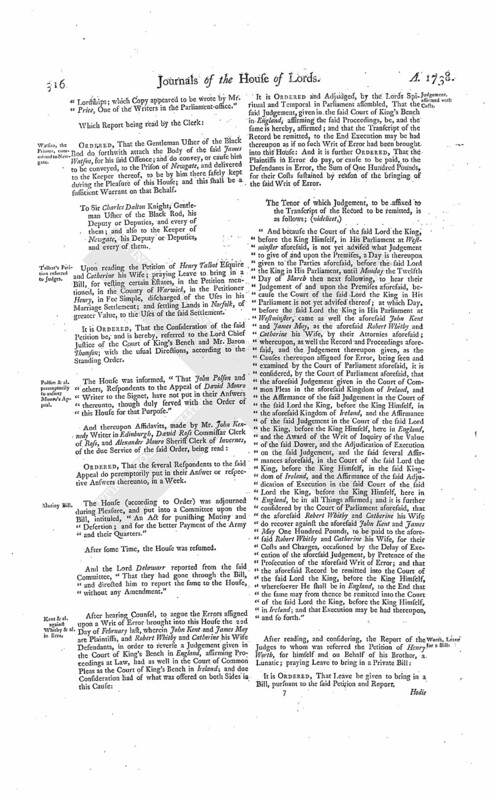 It is Ordered and Adjudged, by the Lords Spiritual and Temporal in Parliament assembled, That the said Judgement, given in the said Court of King's Bench in England, affirming the said Proceedings, be, and the same is hereby, affirmed; and that the Transcript of the Record be remitted, to the End Execution may be had thereupon as if no such Writ of Error had been brought into this House: And it is further Ordered, That the Plaintiffs in Error do pay, or cause to be paid, to the Defendants in Error, the Sum of One Hundred Pounds, for their Costs sustained by reason of the bringing of the said Writ of Error. "And because the Court of the said Lord the King, before the King Himself, in His Parliament at Westminster aforesaid, is not yet advised what Judgement to give of and upon the Premises, a Day is thereupon given to the Parties aforesaid, before the said Lord the King in His Parliament, until Monday the Twelfth Day of March then next following, to hear their Judgement of and upon the Premises aforesaid, because the Court of the said Lord the King in His Parliament is not yet advised thereof; at which Day, before the said Lord the King in His Parliament at Westminster, came as well the aforesaid John Kent and James May, as the aforesaid Robert Whitby and Catherine his Wife, by their Attornies aforesaid; whereupon, as well the Record and Proceedings aforesaid, and the Judgement thereupon given, as the Causes thereupon assigned for Error, being seen and examined by the Court of Parliament aforesaid, it is considered, by the Court of Parliament aforesaid, that the aforesaid Judgement given in the Court of Common Pleas in the aforesaid Kingdom of Ireland, and the Affirmance of the said Judgement in the Court of the said Lord the King, before the King Himself, in the aforesaid Kingdom of Ireland, and the Affirmance of the said Judgement in the Court of the said Lord the King, before the King Himself, here in England, and the Award of the Writ of Inquiry of the Value of the said Dower, and the Adjudication of Execution on the said Judgement, and the said several Affirmances aforesaid, in the Court of the said Lord the King, before the King Himself, in the said Kingdom of Ireland, and the Affirmance of the said Adjudication of Execution in the said Court of the said Lord the King, before the King Himself, here in England, be in all Things affirmed; and it is further considered by the Court of Parliament aforesaid, that the aforesaid Robert Whitby and Catherine his Wife do recover against the aforesaid John Kent and James May One Hundred Pounds, to be paid to the aforesaid Robert Whitby and Catherine his Wife, for their Costs and Charges, occasioned by the Delay of Execution of the aforesaid Judgement, by Pretence of the Prosecution of the aforesaid Writ of Error; and that the aforesaid Record be remitted into the Court of the said Lord the King, before the King Himself, wheresoever He shall be in England, to the End that the same may from thence be remitted into the Court of the said Lord the King, before the King Himself, in Ireland; and that Execution may be had thereupon, and so forth." Hodie 1a vice lecta est Billa, intituled, "An Act for selling and disposing of Part of the Estate of John Worth Esquire, a Lunatic, for discharging the Debts, Portions, and Encumbrances, charged upon and affecting the same." 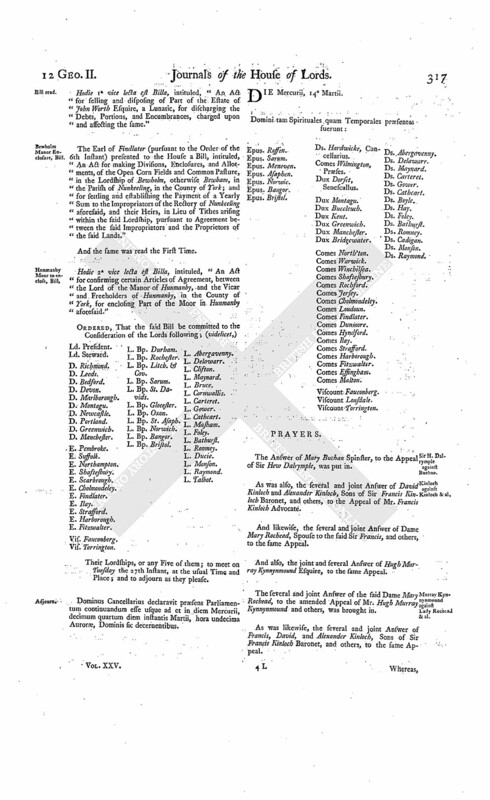 The Earl of Findlater (pursuant to the Order of the 6th Instant) presented to the House a Bill, intituled, An Act for making Divisions, Enclosures, and Allotments, of the Open Corn Fields and Common Pasture, in the Lordship of Bewholm, otherwise Bewham, in the Parish of Nunkeeling, in the County of York; and for settling and establishing the Payment of a Yearly Sum to the Impropriators of the Rectory of Nunkeeling aforesaid, and their Heirs, in Lieu of Tithes arising within the said Lordship, pursuant to Agreement between the said Impropriators and the Proprietors of the said Lands." Hodie 2a vice lecta est Billa, intituled, "An Act for confirming certain Articles of Agreement, between the Lord of the Manor of Hunmanby, and the Vicar and Freeholders of Hunmanby, in the County of York, for enclosing Part of the Moor in Hunmanby aforesaid." Their Lordships, or any Five of them; to meet on Tuesday the 27th Instant, at the usual Time and Place; and to adjourn as they please. Dominus Cancellarius declaravit præsens Parliamentum continuandum esse usque ad et in diem Mercurii, decimum quartum diem instantis Martii, hora undecima Auroræ, Dominis sic decernentibus. The Answer of Mary Buchan Spinster, to the Appeal of Sir Hew Dalrymple, was put in. Kinloch against Kinloch & al. As was also, the several and joint Answer of David Kinloch and Alexander Kinloch, Sons of Sir Francis Kinloch Baronet, and others, to the Appeal of Mr. Francis Kinloch Advocate. And likewise, the several and joint Answer of Dame Mary Rochead, Spouse to the said Sir Francis, and others, to the same Appeal. And also, the joint and several Answer of Hugh Murray Kynnynmound Esquire, to the same Appeal. Murray Kynnynmound against Lady Rochead & al. The several and joint Answer of the said Dame Mary Rochead, to the amended Appeal of Mr. Hugh Murray Kynnynmound and others, was brought in. As was likewise, the several and joint Answer of Francis, David, and Alexander Kinloch, Sons of Sir Francis Kinloch Baronet, and others, to the same Appeal. Sir H. Dalrymple against Sir A. Hope & al. et è contra. The House being this Day moved, "In regard both the said Appeals relate to the same Matter, that they be heard together:"
It is Ordered, That this House will hear Counsel on the said Appeals, and the Answers put in thereunto, on Monday the 26th Day of this Instant March. Murray Kynnynmound & al against Kinloch & al. et è contra. It is Ordered, That this House will hear Counsel, on the said Appeals, and the Answers put in thereunto, on Wednesday the 28th Day of this Instant March. 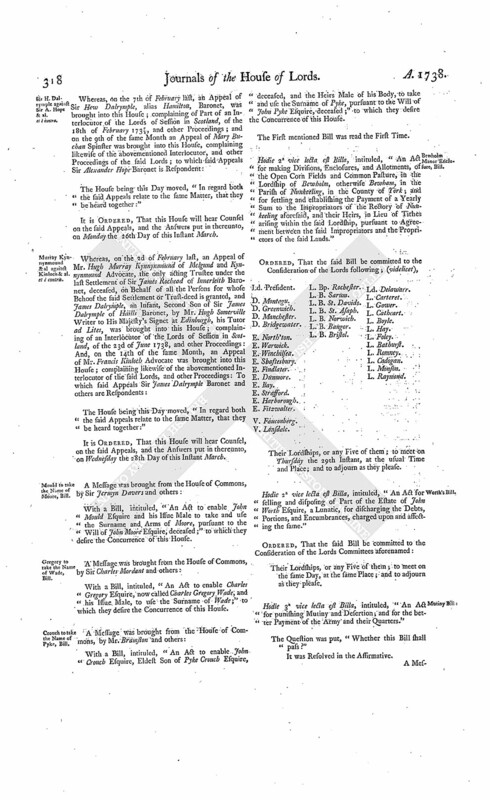 With a Bill, intituled, "An Act to enable John Mould Esquire and his Issue Male to take and use the Surname and Arms of Moore, pursuant to the Will of John Moore Esquire, deceased;" to which they desire the Concurrence of this House. 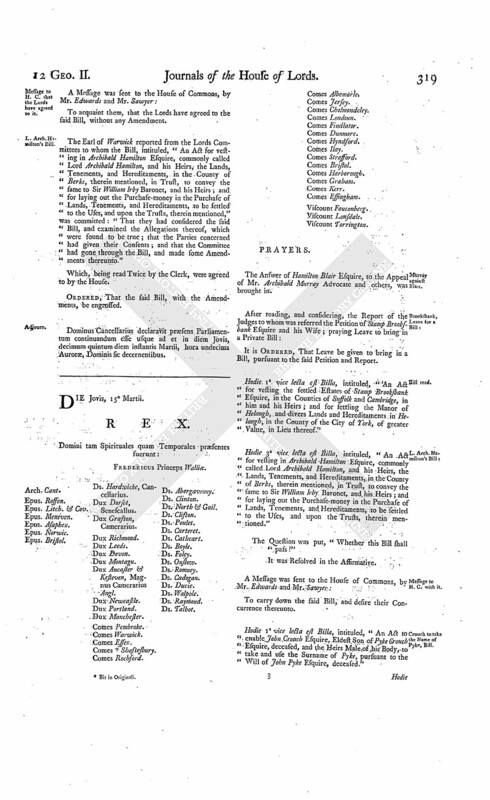 With a Bill, intituled, "An Act to enable Charles Gregory Esquire, now called Charles Gregory Wade, and his Issue Male, to use the Surname of Wade;" to which they desire the Concurrence of this House. Crouch to take the Name of Pyke, Bill. With a Bill, intituled, "An Act to enable John Crouch Esquire, Eldest Son of Pyke Crouch Esquire, deceased, and the Heirs Male of his Body, to take and use the Surname of Pyke, pursuant to the Will of John Pyke Esquire, deceased;" to which they desire the Concurrence of this House. The First mentioned Bill was read the First Time. Hodie 2a vice lecta est Billa, intituled, "An Act for making Divisions, Enclosures, and Allotments, of the Open Corn Fields and Common Pasture, in the Lordship of Bewholm, otherwise Bewham, in the Parish of Nunkeeling, in the County of York; and for settling and establishing the Payment of a Yearly Sum to the Impropriators of the Rectory of Nunkeeling aforesaid, and their Heirs, in Lieu of Tithes arising within the said Lordship, pursuant to Agreement between the said Impropriators and the Proprietors of the said Lands." V. Lonsdale. L. Bp. Rochester. Their Lordships or any Five of them; to meet on Thursday the 29th Instant, at the usual Time and Place; and to adjourn as they please. Hodie 2a vice lecta est Billa, intituled, "An Act for selling and disposing of Part of the Estate of John Worth Esquire, a Lunatic, for discharging the Debts, Portions, and Encumbrances, charged upon and affecting the same." The Earl of Warwick reported from the Lords Committees to whom the Bill, intituled, "An Act for vesting in Archibald Hamilton Esquire, commonly called Lord Archibald Hamilton, and his Heirs, the Lands, Tenements, and Hereditaments, in the County of Berks, therein mentioned, in Trust, to convey the same to Sir William Irby Baronet, and his Heirs; and for laying out the Purchase-money in the Purchase of Lands, Tenements, and Hereditaments, to be settled to the Uses, and upon the Trusts, therein mentioned," was committed: "That they had considered the said Bill, and examined the Allegations thereof, which were found to be true; that the Parties concerned had given their Consents; and that the Committee had gone through the Bill, and made some Amendments thereunto." Dominus Cancellarius declaravit præsens Parliamentum continuandum esse usque ad et in diem Jovis, decimum quintum diem instantis Martii, hora undecima Auroræ, Dominis sic decernentibus. The Answer of Hamilton Blair Esquire, to the Appeal of Mr. Archibald Murray Advocate and others, was brought in. Hodie 1a vice lecta est Billa, intituled, "An Act for vesting the settled Estates of Stamp Brooksbank Esquire, in the Counties of Suffolk and Cambridge, in him and his Heirs; and for settling the Manor of Helaugh, and divers Lands and Hereditaments in Helaugh, in the County of the City of York, of greater Value, in Lieu thereof." Hodie 3a vice lecta est Billa, intituled, "An Act for vesting in Archibald Hamilton Esquire, commonly called Lord Archibald Hamilton, and his Heirs, the Lands, Tenements, and Hereditaments, in the County of Berks, therein mentioned, in Trust, to convey the same to Sir William Irby Baronet, and his Heirs; and for laying out the Purchase-money in the Purchase of Lands, Tenements, and Hereditaments, to be settled to the Uses, and upon the Trusts, therein mentioned." Hodie 1a vice lecta est Billa, intituled, "An Act to enable John Crouch Esquire, Eldest Son of Pyke Crouch Esquire, deceased, and the Heirs Male of his Body, to take and use the Surname of Pyke, pursuant to the Will of John Pyke Esquire, deceased." Hodie 1a vice lecta est Billa, intituled, "An Act to enable Charles Gregory Esquire, now called Charles Gregory Wade, and his Issue Male, to use the Surname of Wade." Hodie 2a vice lecta est Billa, intituled, "An Act to enable John Mould Esquire, and his Issue Male, to take and use the Surname and Arms of Moore, pursuant to the Will of John Moore Esquire, deceased." V. Lonsdale. L. Abp. Cant. L. B. Bristol. L. Abergavenny. His Majesty, being seated on the Throne, with the accustomed Ceremonies; the Prince of Wales, in his Robes, sitting in his Place; the Lords being also in their Robes; commanded the Gentleman Usher of the Black Rod to let the Commons know, "That it is His Majesty's Pleasure, they attend Him immediately, in this House." "1. An Act for punishing Mutiny and Desertion, and for the better Payment of the Army and their Quarters." "2. 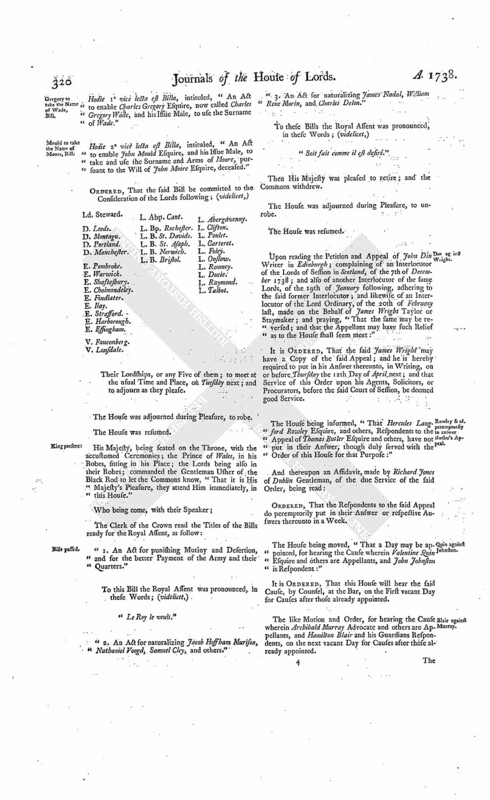 An Act for naturalizing Jacob Hoffham Murison, Nathaniel Voogd, Samuel Cley, and others." "3. An Act for naturalizing James Nadal, William Rene Morin, and Charles Delon." Upon reading the Petition and Appeal of John Din Writer in Edinburgh; complaining of an Interlocutor of the Lords of Session in Scotland, of the 7th of December 1738; and also of another Interlocutor of the same Lords, of the 19th of January following, adhering to the said former Interlocutor; and likewise of an Interlocutor of the Lord Ordinary, of the 20th of February last, made on the Behalf of James Wright Taylor or Staymaker; and praying, "That the same may be reversed; and that the Appellant may have such Relief as to the House shall seem meet:"
It is Ordered, That the said James Wright may have a Copy of the said Appeal; and he is hereby required to put in his Answer thereunto, in Writing, on or before Thursday the 12th Day of April next; and that Service of this Order upon his Agents, Solicitors, or Procurators, before the said Court of Session, be deemed good Service. Rowley & al. peremptorily to answer Butler's Appeal. 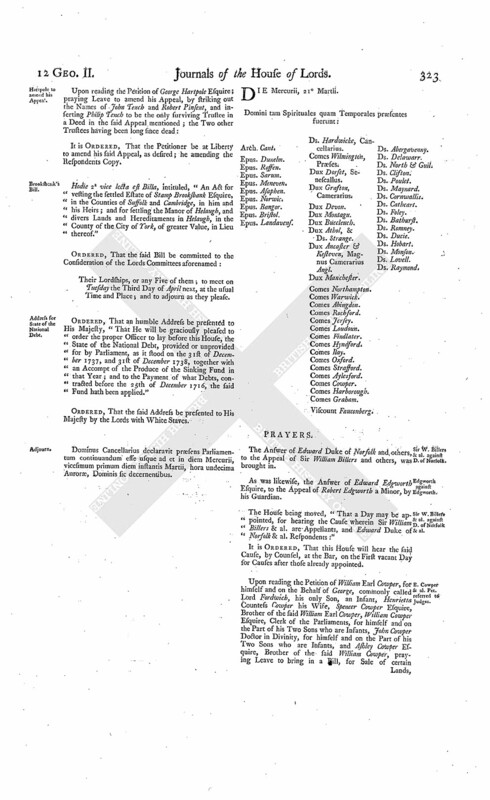 The House being informed, "That Hercules Langford Rowley Esquire, and others, Respondents to the Appeal of Thomas Butler Esquire and others, have not put in their Answer, though duly served with the Order of this House for that Purpose:"
Ordered, That the Respondents to the said Appeal do peremptorily put in their Answer or respective Answers thereunto in a Week. The House being moved, "That a Day may be appointed, for hearing the Cause wherein Valentine Quin Esquire and others are Appellants, and John Johnston is Respondent:"
The like Motion and Order, for hearing the Cause wherein Archibald Murray Advocate and others are Appellants, and Hamilton Blair and his Guardians Respondents, on the next vacant Day for Causes after those already appointed. Deykins to enter into Recognizance for Din. The House being moved, "That Francis Deykins of London Haberdasher may be permitted to enter into a Recognizance for John Din, on account of his Appeal depending in this House; he being in Scotland:"
It is Ordered, That the said Francis Deykins may enter into a Recognizance for the Appellant, as desired. Ordered, That the Lords with White Staves do, from this House, wait on His Majesty, to congratulate Him on the joyful Occasion of her Royal Highness the Princess of Wales happy Delivery of a Second Prince. And their Royal Highnesses also. Ordered, That a Message be sent from this House, to congratulate their Royal Highnesses the Prince and Princess of Wales, on the same joyful Occasion; and that the Duke of Manchester and the Lord Cadogan do carry the said Message. Committee to consider how Persons are to be admitted into the Gallery. Their Lordships, or any Five of them; to meet at the usual Place, on Tuesday next; and to adjourn as they please. Dominus Cancellarius declaravit præsens Parliamentum continuandum esse usque ad et in diem Lunæ, decimum nonum diem instantis Martii, hora undecima Auroræ, Dominis sic decernentibus. E. of Westmeath against Dr. Madden & al. 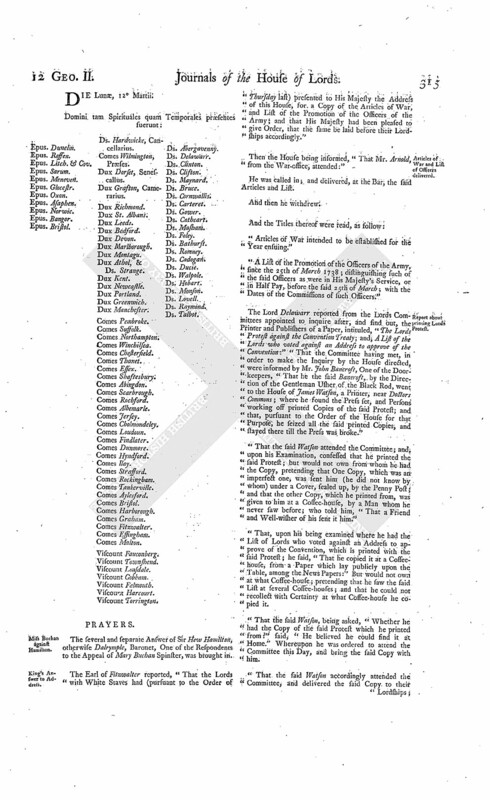 The Answer of the Reverend Doctor John Madden Dean of Kilmore, and others, to the Appeal of Thomas Earl of Westmeath in the Kingdom of Ireland, was brought in. Dillon against Attorney General of Ireland. As was likewise, the Answer of Robert Jocelyn Esquire, His Majesty's Attorney General in Ireland, to the Appeal of Robert Dillon and others. Munroe against Davidson & al. And also, the several and joint Answer of John Davidson of Whitehouse Clerk of Justiciary, Alexander Ross Writer to His Majesty's Signet, and others, Creditors to Alexander Ross of Easterfearn, or to his Father, to the Appeal of David Monro, Writer to the Signet. The Lord Steward reported, "That the Lords with White Staves (pursuant to the Order of this House on Thursday last) had waited on His Majesty, to congratulate Him on the joyful Occasion of her Royal Highness the Princess of Wales's happy Delivery of another Prince; and that His Majesty was pleased to receive their Lordships Congratulation very graciously, and to look upon it as a fresh Instance of their Duty and Affection to His Person and Family." The Duke of Manchester reported, "That he and the Lord Cadogan had also (according to Order) at tended his Royal Highness the Prince of Wales, with the Congratulatory Message from this House, on the same joyful Occasion; and that His Royal Highness was pleased to say, He thanked their Lordships, for this Mark of their Duty to the King, and Regard for him." The House being moved, "That a Day may be appointed, for hearing the Cause wherein David Monro is Appellant, and John Polson & al. are Respondents:"
The like Motion and Order, for hearing the Cause wherein Thomas Earl of Westmeath is Appellant, and Doctor John Madden and others are Respondents, on the next vacant Day for Causes after those already appointed. The like Motion and Order, for hearing the Cause wherein James Lavallin & al. are Appellants, and Christian Gould is Respondent, on the next vacant Day for Causes after those already appointed. The like Motion and Order, for hearing the Cause wherein Robert Dillon & al. are Appellants, and Robert Jocelyn Esquire, His Majesty's Attorney General in Ireland, is Respondent, on the next vacant Day for Causes after those already appointed. 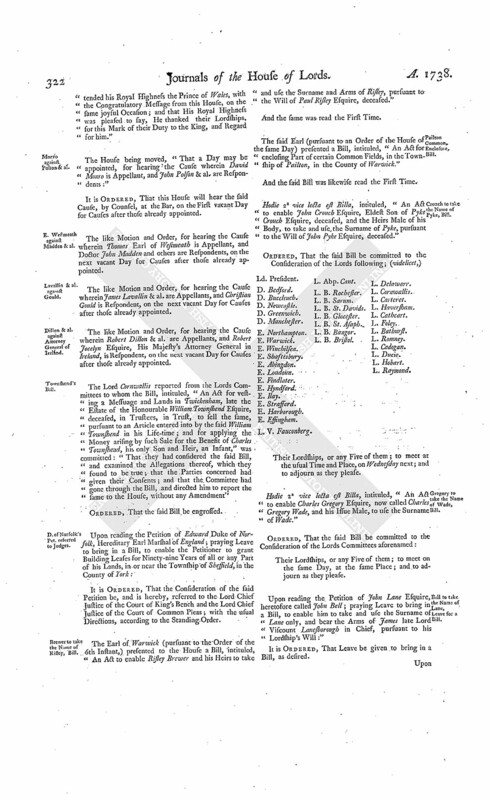 The Lord Cornwallis reported from the Lords Committees to whom the Bill, intituled, "An Act for vesting a Messuage and Lands in Twickenham, late the Estate of the Honourable William Townshend Esquire, deceased, in Trustees, in Trust, to sell the same, pursuant to an Article entered into by the said William Townshend in his Life-time; and for applying the Money arising by such Sale for the Benefit of Charles Townshend, his only Son and Heir, an Infant," was committed: "That they had considered the said Bill, and examined the Allegations thereof, which they found to be true; that the Parties concerned had given their Consents; and that the Committee had gone through the Bill, and directed him to report the same to the House, without any Amendment"
D. of Norfolk's Pet. referred to Judges. The Earl of Warwick (pursuant to the Order of the 6th Instant,) presented to the House a Bill, intituled, "An Act to enable Risley Brewer and his Heirs to take and use the Surname and Arms of Risley, pursuant to the Will of Paul Risley Esquire, deceased." The said Earl (pursuant to an Order of the House of the same Day) presented a Bill, intituled, "An Act for enclosing Part of certain Common Fields, in the Township of Pailton, in the County of Warwick." And the said Bill was likewise read the First Time. Hodie 2a vice lecta est Billa, intituled, "An Act to enable John Crouch Esquire, Eldest Son of Pyke Crouch Esquire, deceased, and the Heirs Male of his Body, to take and use, the Surname of Pyke, pursuant to the Will of John Pyke Esquire, deceased." L. V. Fauconberg. L. Abp. Cant. Hodie 2a vice lecta est Billa, intituled, "An Act to enable Charles Gregory Esquire, now called Charles Gregory Wade, and his Issue Male, to use the Surname of Wade." Bell to take the Name of Lane, Leave for a Bill. Upon reading the Petition of John Lane Esquire, heretofore called John Bell; praying Leave to bring in a Bill, to enable him to take and use the Surname of "Lane only, and bear the Arms of James late Lord Viscount Lanesborough in Chief, pursuant to his Lordship's Will:"
Hartpole to amend his Appeal. It is Ordered, That the Petitioner be at Liberty to amend his said Appeal, as desired; he amending the Respondents Copy. Hodie 2a vice lecta est Billa, intituled, "An Act for vesting the settled Estate of Stamp Brooksbank Esquire, in the Counties of Suffolk and Cambridge, in him and his Heirs; and for settling the Manor of Helaugh, and divers Lands and Hereditaments in Helaugh, in the County of the City of York, of greater Value, in Lieu thereof." Their Lordships, or any Five of them; to meet on Tuesday the Third Day of April next, at the usual Time and Place; and to adjourn as they please. Ordered, That an humble Address be presented to His Majesty, "That He will be graciously pleased to order the proper Officer to lay before this House, the State of the National Debt, provided or unprovided for by Parliament, as it stood on the 31st of December 1737, and 31st of December 1738, together with an Accompt of the Produce of the Sinking Fund in that Year; and to the Payment of what Debts, contracted before the 25th of December 1716, the said Fund hath been applied." Dominus Cancellarius declaravit præsens Parliamentum continuandum esse usque ad et in diem Mercurii, vicesimum primum diem instantis Martii, hora undecima Auroræ, Dominis sic decernentibus.